Beautiful historic stock certificate from the Bull Creek Oil Company issued in 1864 during Civil War. This historic document has an ornate border around it with a vignette of an early oil field and derrick, and has a Civil War era tax stamp affixed to its face. Light ledger residue on left margin. This item has the signatures of the Company's officers. Pen cancelled. This certificate was issued a year after West Virginia was admitted to the United States. In 1861, 50 northwestern counties of Virginia decided to break away from Virginia during the American Civil War to form West Virginia. 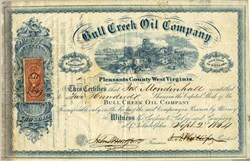 The Bull Creek Oil Company had operations inWest Virginia , and their business office was located in Philadelphia, Pennsylvania.